MusiciansFriend.com had these on sale for $49 and free shipping, so I figured it was about time we took the SG-1-40 luthier's bulbs to a real acoustic guitar. It is listed as a "whitewood body" with painted maple bridge and fingerboard. I kid you not, but then again, you can't really expect more than that for $49. For our purposes, it will work fine. 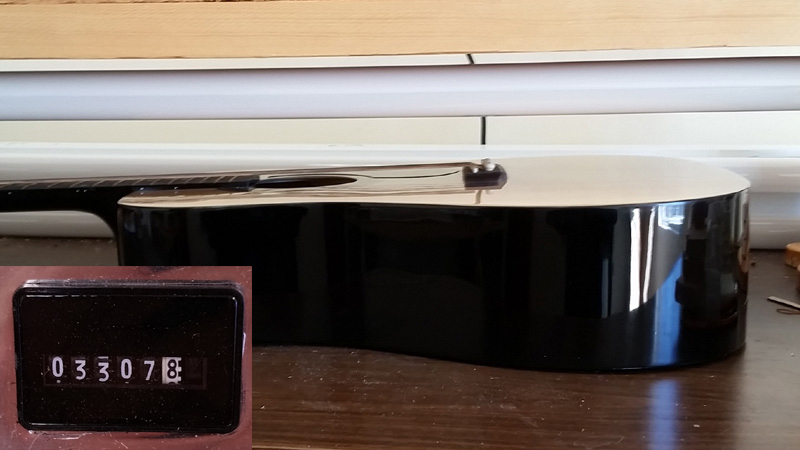 Because this is thin wood, similar a violin, I'm going to run the same wattage and lamps that I use in our Violin Kits, which range from 40 to 45 watts per bulb. The voltmeter tells me I'm pushing exactly 40 watts per bulb, although I got lazy and just modified the ballast system I already had loaded in Rig #1. They are in the same family, so the results will be the same. I'm using a total of 6 lamps on the flat top. 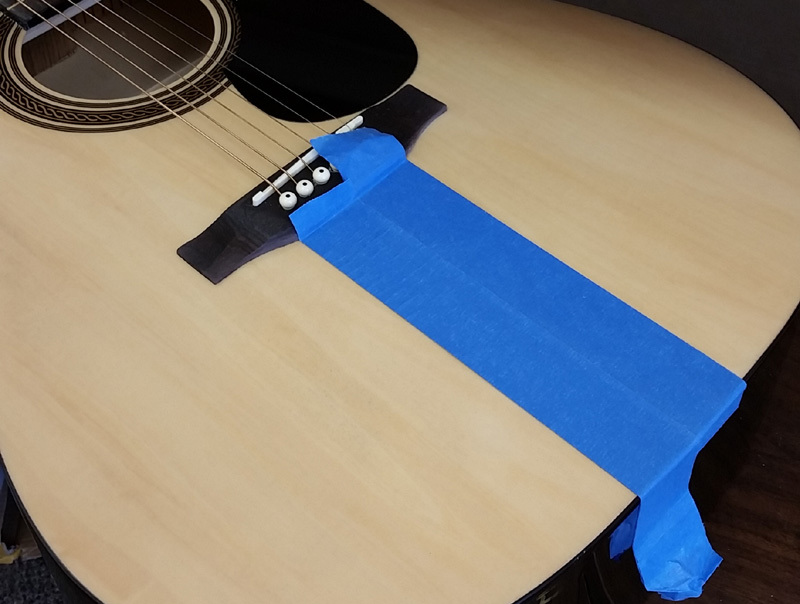 Normally, I would have taped off the entire guitar and taken extraordinary precautions to insure we don't expose the rest of the guitar, but it is a $49 guitar, so I just don't care. 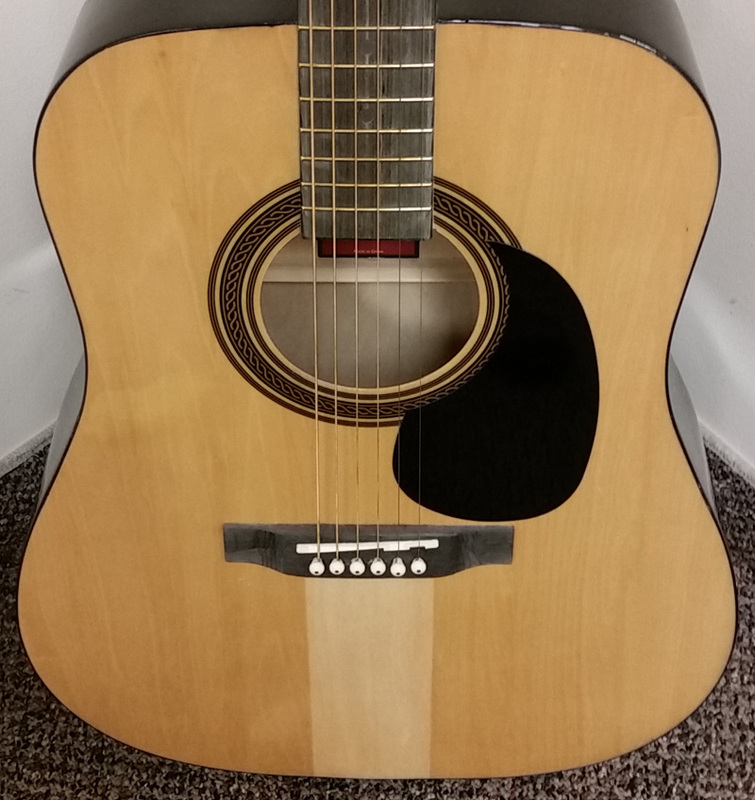 Afterwards, it will likely sit in the office as a picker when I'm bored, or I will just give it to some young kid that wants to play guitar. After I adjusted the truss rod a bit on it, it is actually a fair sounding guitar with pretty good action, so putting it to use seems reasonable. To give us the real "before and after", I took some blue tape I had lying around from when I aged down an Epiphone Les Paul. Literally the same tape I used in that stripe in fact, and just recycled it, so we will have a fat stripe at the end of the guitar. Plenty to demonstrate what is happening. It is Friday 2pm-ish, and I'm going to let it run all weekend. The hour meter on my rig is now at 3307.8, so we can measure the exact time it takes. These hour meters are a bit expensive since they are analog, but they are invaluable when doing certain jobs, and worth spending $50. 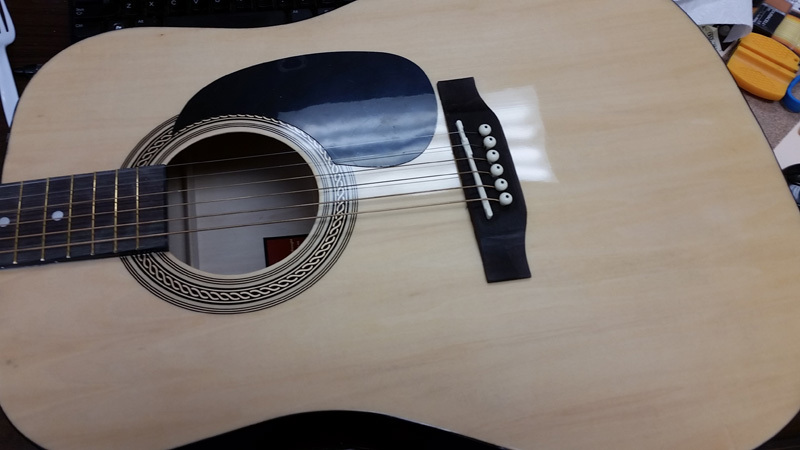 This is the guitar as I received it today from Fedex. Lots of finish flaw, a small dip in the top itself, not exactly a prize winning guitar, but it looks good from a distance, plays pretty good in spite of having garbage strings and sound pretty good. Well worth the regular price. 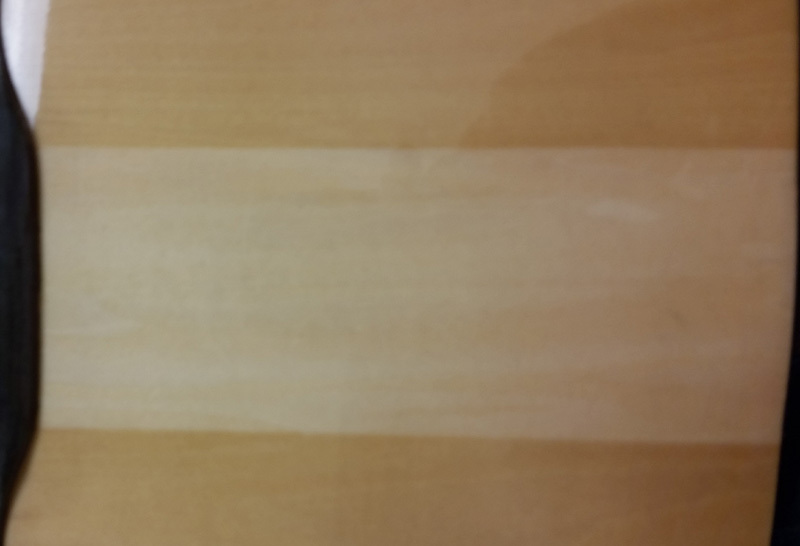 Here is the racing stripe I'm putting on it. Yes, it will probably look silly when I'm done, but the goal is showing you what the lights will do, without any question. The lamps are just 1.5" from each other, so I can get this close without striping. Remember, you can only get as close as your lamps are to each other: If you lamps have a 4" gap between them, you can't get closer than 4" to the product. There is no right or wrong number of hours, I just chose to be around 72 hours because the math worked out with it being over the weekend. Keep in mind, we are just running these lamps in medium power mode, not VHO. 40 watts each instead of 80 or 100 watts. We do this to cut down on the heat, as the top of the guitar is a thin veneer, much like a Gibson ES335 or violin, although likely more fragile. So it ages slower than if we have them at VHO (very high output) levels. About 50% as fast. Plus we are having to shoot through the finish, which blocks a lot of UV. The pictures below are worth more than anything I can say. It did exactly what we expected it to do. The wood has a very natural look, aged to perfection. This is what violin makers and hand crafted guitar builders want, to create an instant classic in a few days. Of course, I could expose it longer and get even darker, but you reach a plateau soon. If you were exposing solid body guitars at 80 watts each, you could cut the time in half to get the same result. For this image, I split the before and after picture. As you can see, the gain is much more visible and the guitar has a lot more appeal. 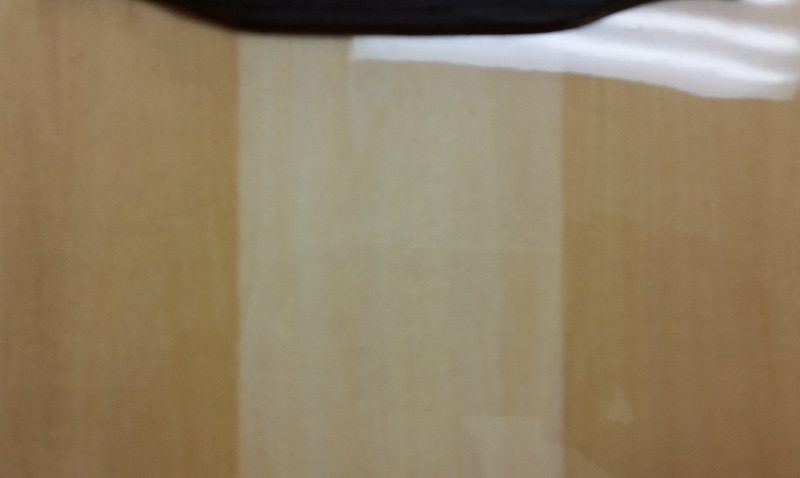 It is hard to see in the photo, but the aged grain looks more "real", less fake-like than the guitar looked new. Close up showing the taped off area. Another close up showing the taped off area. There is a little paint overspray, but that was there before the aging. It is a $49 guitar, after all. 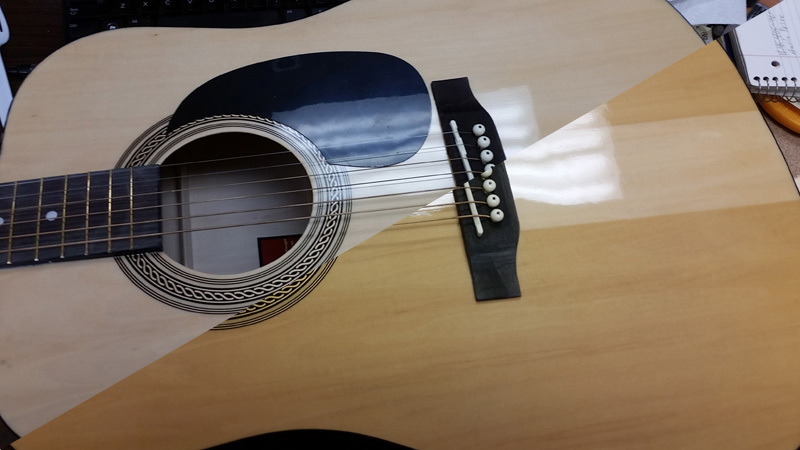 Even the fretboard is just painted. I did notice that the guitar was tuned before aging, and it dropped down a full step, two notes, while being aged. After tuning, it sounds and plays exactly the same to me; respectable for a cheap guitar, so as I would expect, the aging had no effect on that. The guitar looks better after the aging. Before exposure, the grain was barely visible and the finish had a plastic-like look to it. After aging, it looks like an old favorite. 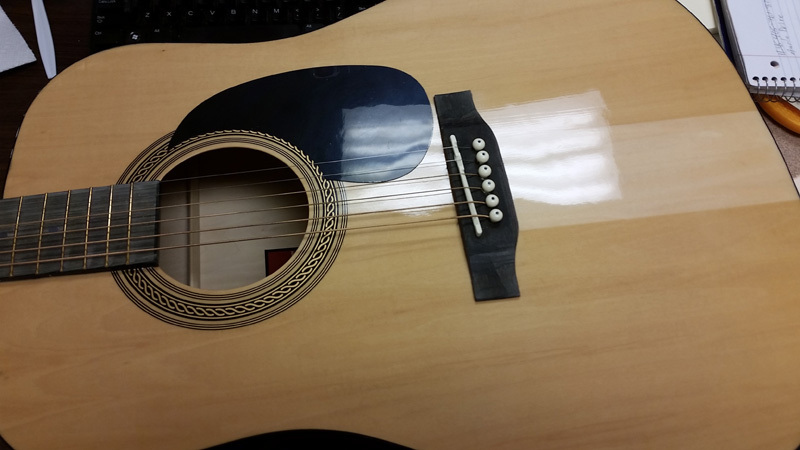 This proves that we can take a $49 guitar and make it look much, much better. Just imagine what it can do for your projects.